#3-4 animal print. I was sad that I didn't have any animal print to join that day. 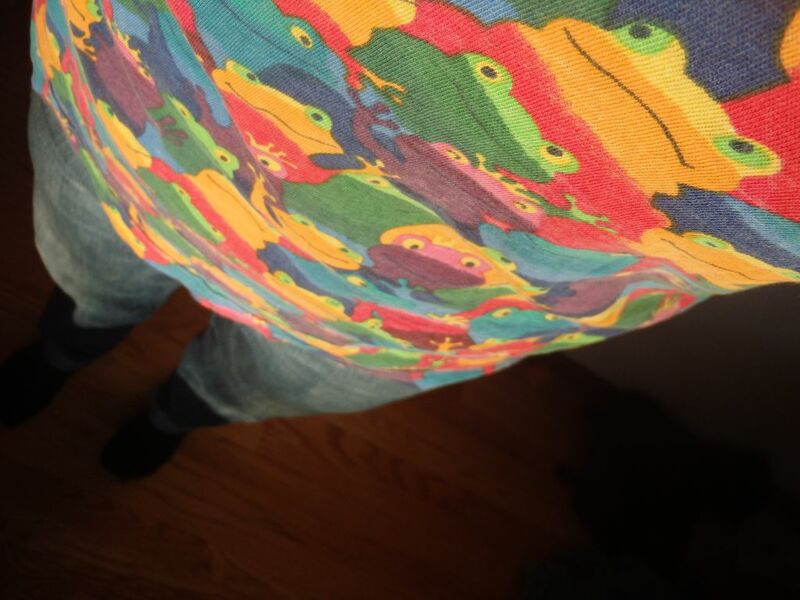 Then I remembered this frog tee shirt. It's quite old, and the outfit was really casual (more than even I usually wear), but it wasn't bad for a day home with the kids. And my 5 year old loved that my tee matched his underwear (they were sewn from the same sheet years ago). #5 Daytime sparkle. I thought this outfit looked better in person - jeans, sparkly sweater, a jacket, and silver shoes. I got compliments on it. #9. Umm... no black again? gray and teal over blue jeans. #10 Color blocking that I just may re-wear when it's scheduled. I ended up liking this super bright cashmere sweater over blues. All comments are welcome! And thanks for a fun challenge Ingunn - it's been just the thing to get me enjoying my clothes again! I laughed myself silly about your frog tee matching your son's undies. So cute! I agree with you that the blues really soften the bright of that fun colour blocked sweater. And then you have double colour blocking! I admire your dress/ pants outfit; this is something I really struggle with myself and I am not sure I can come up with an actual outfit that I would wear that involves those two elements. But I'm going to try it tomorrow. Better late than never. Fun how this rescued your coloured skinnies. I think #5 is my favourite here, so not surprised it got compliments. Wow, Amy, I think Ingunn's challenge inspired some amazing outfits for you. I love the dress over skinnies in 2. The fab outfit in 5 really caught my eye, too, and I bet it did look even more stunning in person with the shiny elements. The lace is 6 is such a fun element with your boyfriend jeans, and the layers in 9 are terrific. I love the jacket in #1, dress over pants looks great too. Other standouts for me are 5,6 8 and 10. I'm not surprised you got compliments for 5, you look wonderful in that outfit. The color block sweater is adorable! Such a pretty pink coat in #1! Isn't a dress over pants, or skirt over leggings, just super comfortable?! As well as a fresh, different silhouette. You look wonderful in #5--polished and professional with seasonal sparkle. And the blue shirt works unexpectedly well with the colorblock sweater. I probably wouldn't have thought to try it; but it looks great! Also especially like #5 and also the dress over pants in #2!